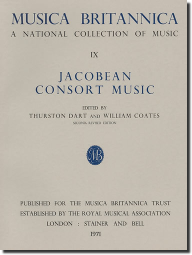 A rich anthology of fantasias and dances for 'whole' consorts of two to six parts, by 34 composers from Adson to Wilbye - and Anon. There is also a substantial section containing music for strings and keyboards, and another of music for division viol and lyra viol. First published in 1955, revised 1962 and reprinted with corrections 1971. Further reprint 1977.